With its tiny winged frame and reptilian face, the "dead alien" has all the hallmarks of an elaborate hoax, but some alien investigators believe it could be the real deal. 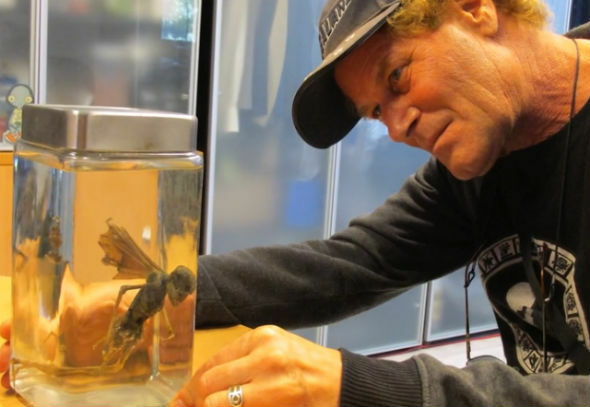 Author Brian Foerster claims to have found the unusual winged small humanoid corpse in a speciman jar in an office in Mexico earlier this year. Claims are now being made in a video clip online that X-rays carried out on the "dead body" have shown a skeletal structure inside, leading to calls for further analysis, including DNA tests. But there have been claims the clip entitled "What is this weird creature with wings in this jar?" could be an online money spinner, because the clip promotes a website where viewers have to pay to see the full documentary. In a promotional blurb for the video clip, Mr Foerster wrote: "I saw this very odd animal in an office in Mexico City in January of 2016. In the clip, which appear to be highlights from a longer documentary, LA Marzulli, an author and filmmaker, is seen investigating the discovery. He meets with Mexican paranormal journalist Jamie Maussan, who says: "It is a hybrid, and that is something very important, because i believe these are confidential experiments, and why I don't know. "But we have a physical body. We can analyse that physical body and prove that something, an intelligence, is behind these experiments." Mr Marzulli is then seen with an unnamed man in a white lab coat with glasses, who viewers would assume was a scientist. He says: "It has wings. We have an X-ray of this creature and we can see the structure of the bones. Mr Marzulli asks him: "So this is not a hoax, because an X-ray would show if it was a puppet or a mould?" The man replies: "No, it is not a hoax. It is not a mould." - Could this strange corpse be the world's first proof aliens have visited Earth? In one of Carl Sagan's last books, he noted that astronomy has brought humanity to a series of "great demotions." Simply put: When we first observed the night sky, we thought the Earth was in the center of the universe. Over time, as he described in Pale Blue Dot, we tried out other theories as the criteria fit: Maybe the sun is at the center of the universe? Perhaps we're in an important part of the galaxy? We now know the Earth is in the suburbs of the Milky Way, and our solar system is only special because we live in it, but this series of demotions shows us one thing: it's easy to project our image on to the universe. This is especially true when searching for life. Because there is only one case of life as we know it -- life on Earth -- it's easiest to look for life like ours. But in reality our kind of life may not be the most common type to look for after all. DAYTONA BEACH (CBSMiami/AP) — A small earthquake struck about 100 miles off Daytona Beach in the Atlantic Ocean. The U.S. Geological Survey says the magnitude 3.7 earthquake struck at about 4 p.m. Saturday. There are no reports of damage or that it was felt on land. Earthquakes in Florida are rare and those that cause damage are almost nonexistent. According to the USGS, two earthquakes that struck 10 minutes apart in January 1879 knocked plaster from walls in St. Augustine and were felt as far away as Tampa on the Gulf coast. Earthquakes of less than magnitude 5.4 rarely cause damage. The USGS says there are about 930,000 such quakes recorded worldwide each year or about 2,500 per day. Why do so many Brits believe in ghosts?